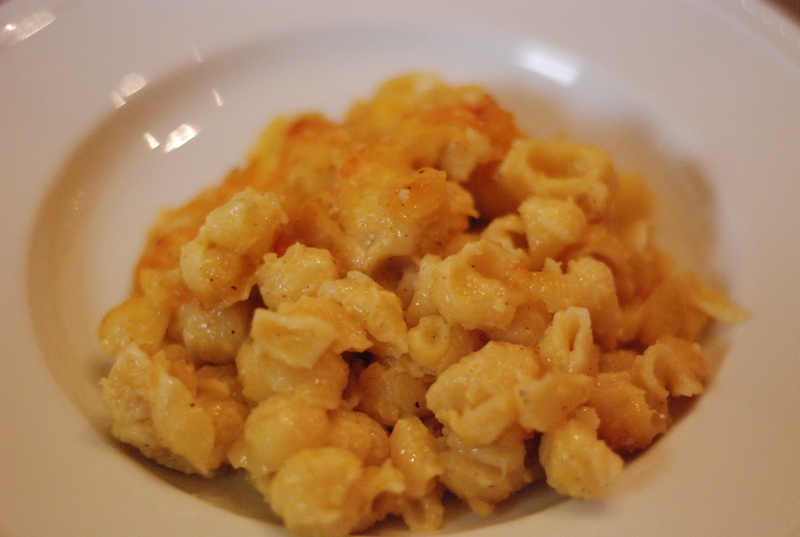 I’m starting to come around on the mac and cheese, as I try out new recipes. I’ve made the Pioneer Woman’s several times but it’s never been as flavorful as I’d like (Matt disagrees). When I found this recipe, I thought it sounded right up my alley. Cheesy without being dry, and more than just your standard cheddar cheese. That said, this is a LOT of cheese. A lot. It’s not a light dish, and it’s pretty rich but man, is it delicious. This might just find its way onto our Easter table. Preheat your oven to 375 and prepare a large baking dish with non-stick spray. Grate cheeses into one bowl as you prepare pasta according to package directions. Cook pasta a few minutes less than the package calls for so that it’s not quite al dente. Heat a large skillet over medium heat and add butter and olive oil. Toss in shallot and cook for 2-3 minutes. Add garlic and stir until fragrant, about 30 seconds. Add flour and whisk constantly for 2-3 minutes, creating a roux. Pour in milk and stir constantly, another 2 minutes. Add mascarpone and almost all of the grated cheeses, reserving a good handful to top macaroni with before baking. Stir constantly until mixture thickens, about 4 minutes. Add nutmeg, stir and taste, adding salt and pepper to taste. Add pasta to mixture, tossing to coat. Taste again to adjust seasonings. Pour delicious pasta mixture into your prepared baking dish and top with panko and reserved cheeses. Bake for 30 minutes, being careful to not over-bake. Serve immediately, not that you’ll be able to keep from doing so. The original recipe calls for you to bake the pasta in the dish in which you prepared it. I did this with my beautiful turquoise Le Crueset pot, and there was a time during cleaning it when I thought I might have to throw the whole pot out. I admit that I did over-bake the macaroni on accident, but holy cow — it took 24 hours of soaking and scrubbing to get the pot clean. For this reason, I would transfer to a new baking dish as I suggest above. And be careful to not over-bake. Grate your own cheese. Please. Don’t be afraid to salt the pasta water. I used to never do this, and my pasta was always bland. DUH? Just wait til I tell you what to do with that leftover mascarpone… you’re going to love it.